Every feature visible in the PhotonTrader application. Write simple or complex trading rules, customized modules or complete execution plaforms. Built to work with Microsoft programming languages. Sample C# and Photon test applications. For more information, contact api@fptrading.com. 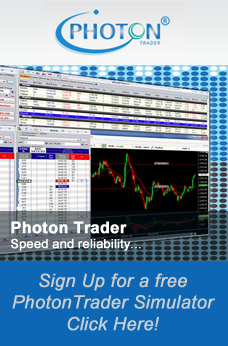 The Photon API is made available for clients interested in creating plugins for PhotonTrader. A plugin uses the same libraries as PhotonTrader. This allows the opportunity to leverage off of the power and speed that PhotonTrader uses. A plugin is launched via the plugin option on our main toolbar. A user can manually load a plugin from your local drive or get approved to be a Photon Plugin Publisher. We will introduce a store with integrated credit card authorization in the near future. Photon Login Service – Handles logging in with a Photon user id and delivers available connection profiles. Account Service – Given an instrument and account set name the service will give you the correct account for an instrument. Instrument List Service – Delivers a list of tradable contracts. Instrument Summary Service – A subscription service that delivers market data including inside bid / offer, last price and quantity, open high, low settlement, volume, etc. L2 Service – A subscription service that delivers market depth. Order Manager – A service that allows for subscription to order events. Accepted, acknowledged, executed, modified, rejected, canceled, etc. Simple Order Sender Service – Service allows for sending orders to the exchanges. Position Reporter Service – A subscription service that delivers position and money information. A developer also has the opportunity to build a standalone application that uses a regular Photon user id. This application is still administered via our administration server. A developer can possibly create an entire front end using our API. The API is built in C# and uses Quickfix. We have 2 sample applications written in C#. One sample is a full featured application that also allows plugin loading. This application is the perfect for debugging plugins. The second sample is a standalone application that simplifies using our services. Try it out, you will love it. Coming from using other trading API’s we decided to build an API that doesn’t make you mad. Our API has a nice object model. It is easy to use and will make both new programmers and seasoned programmers very happy.